It is a fact that almost 90% of Type 2 diabetes can be prevented by attention to diet and the use of specific supplements. However, before having a look at these possibilities, we shall first have a look at what type 2 diabetes is so that the means of prevention can be better understood. Diabetes is a condition, not a disease. It cannot be passed from one person to another, and there is evidence that it is hereditary since it tends to run in families. In the past it tended to develop later in life, although the modern lifestyle appears to have made it more common now in children and young adults. Diabetes occurs when the level of glucose in your blood becomes higher than it should be. The reason for this is twofold: either the body produces no or insufficient insulin or it cannot use the insulin that is produced. Sugars and other carbohydrates are metabolized to glucose that is the body’s source of energy. The parts of your body that do this are the mitochondria that are contained within your body cells, and the hormone insulin is essential in allowing this to happen. When the concentration of glucose in your blood reaches a certain level, the pancreas secretes insulin into your blood. The insulin is synthesized in special cells called the islets of Langerhans, after the person who discovered them. Also produced is glucagon which is also secreted into your bloodstream, and the glucagons and the insulin work together to ensure that your blood glucose levels remain stable (when everything is working correctly). Glucagon is secreted when your glucose levels are low, and its presence in the bloodstream stimulates the conversion of the emergency energy store in the liver (glycogen) to glucose in order to maintain this stability. Insulin, on the other hand, is released after you have consumed a meal, and your glucose levels are high. What insulin does is to stimulate the cells of your body to convert glucose to energy and either use it immediately, or store it as glycogen for use later. By means of these two substances, the level of glucose in your blood is maintained at safe levels – normally. If something happens to the supply of insulin, then the blood sugar level will continue to rise until the bloodstreams contains too much glucose, a condition known as hyperglycemia. The symptoms are excessive thirst, a frequent desire to urinate, fungal infections or thrush around the genital area (due to yeasts and sugar fermentation), and various others such as mood swings, cramps, dizziness and a feeling of tiredness and weakness. Type 1 diabetes occurs when the body produces no insulin, and the only possible treatment is continual insulin injections. Type 2 diabetes is defined in two ways. Either your body does not make enough insulin for your needs, or the cells in your body cannot use the insulin produced properly. It is Type 2 diabetes we are concerned with here, and that we shall be exclusively discussing. With Type 2 diabetes, insulin shots can be provided, but there are other factors that can also help to resolve the problem. Before discussion treatment or prevention, you should be aware of the complications that Type 2 diabetes can lead to. Hyperglycemia is not common with this type of diabetes, but it can develop. 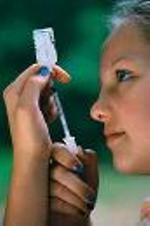 If it does then it can be a life-threatening condition needing a rapid injection of insulin into the bloodstream Symptoms prior to the critical stage are drowsiness and dehydration, although as stated, this is more commonly associated with Type 1 diabetes where regular insulin injections is the normal treatment. Longer term complications of Type 2 include kidney damage, hardening of the arteries, eye problems, impotence and problems with your circulation. Nerve damage can also occur, and it is important that you avoid these by changing your diet and lifestyle. These problems occur if you have had high blood glucose levels over a long period of time, and you therefore have time to take the steps necessary to avoid them if you start now. The same steps will also help you to avoid the condition from occurring. So what are these steps you should take? The first is to look carefully at your diet. A healthy balanced diet is essential if you are to beat your condition naturally and avoid the potential longer term side effects. Diabetes is associated with the overweight and obese. That is not to say that only these people become diabetic, but the majority are. Most people with Type 2 diabetes are overweight, and although around 65% of Americans are overweight or obese, a considerably higher proportion of those with Type 2 diabetes are overweight. The first and obvious action to take to avoid this type of diabetes would therefore be to lose weight, and adopt a healthy diet that is free from junk food, trans fats and alcohol, all of which contribute to obesity. The next is to look to your blood pressure and keep it normal, and also to keep your low density lipoproteins (LDL) low. These affect the propensity for your blood cholesterol to deposit in your arteries, especially if they are oxidized by free radicals. A good antioxidant content is therefore recommended in your diet. Although blood pressure and high LDL levels do not directly contribute to diabetes, they are risk factors that could increase the risk to your health if you are diabetic. You should eat a diet that is high in whole grains and fiber, and eat lean meats and fish rather than fatty foods. Stick to complex carbohydrates that metabolize to glucose slowly and steadily, rather than starchy foods that produce a sudden sugar rush that will give you problems and could promote Type 2 diabetes in those that are prone to it. Specific supplements that you could take include chromium picolinate that can not only be used to treat existing diabetes patients but also to reduce your chances of developing Type 2 diabetes. Studies involving the use of chromium picolinate on patients with this type of diabetes have been very positive, resulting in reduced blood sugar, lipid and insulin levels. The optimum dosage is around 500 micrograms twice daily. Such treatment has been shown to both prevent and reverse Type 2 diabetes. Magnesium is another specific supplement that studies have suggested can lower the risk of developing this type of diabetes. Magnesium rich foods have also been found to be effective, and the fact that a magnesium deficiency can lead to diabetes supports the findings that its use can help to prevent it. Green leafy vegetables such as spinach, and beans nuts and seeds are generally rich in magnesium. Vitamin D can also help protect against the development of diabetes. Although the research is relatively new, it has been established that the cells that produce insulin are affected by a lack of vitamin D in the blood, and low levels of vitamin D can also led to insulin resistance. If you spend more time out in the sun, you should have less chance of contracting Type 2 diabetes, although you could also take a supplement. Although Type 2 diabetes is not as serious as Type 1, no form of diabetes is desirable to have, and ultimately both types can be extremely serious. You should do what you can to avoid diabetes, and Type 2 is easier to avoid then Type 1. Diet, weight and supplementation as described above will all help to avoid contracting this condition, so follow the advice, especially if you are overweight and have a sweet tooth.